ActiveX Controls are the one of the most frequently used Controls while automating any application with VBA. We use different ActiveX Controls in Excel Wiorksheet or UserForm and perform various operations or tasks in Excel Workbook Application. ActiveX Controls are CheckBox, Label, Image, TextBox, ComboBox, ListBox, CommandButton, OptionButton, and we have some controls. We have different Controls to deal with Excel VBA ActiveX Controls. Here you can find brief explanation about each Control and their use explained more detailed way. And also find example codes for better understanding. You can develop any Excel VBA application by using ActiveX Controls on the UserForm. You can use these Controls On the Worksheet to develop dashboards. CheckBox: CheckBox Control is used to specify or indicate binary choice. That is either Turn on or off a value. When we use more checkboxs, you can select more than one CheckBox at a time on the Worksheet or on the UserForm.Please find more information about ActiveX CheckBox Control by clicking on the following link. ComboBox: ComboBox ActiveX Control is used to store and display list of items to a list. ComboBox can be used on the WorkSheet or UserForm. Please find more information about ActiveX ComboBox Control by clicking on the following link. CommandButton: CommandButton is used to run or execute a macro or procedure. It performs a task or an action when a user clicks on a command button. Command Button can be used on the WorkSheet or UserForm. Please find more information about ActiveX CommandButton Control by clicking on the following link. Image: Image control embeds a picture such as a jpg, jpeg, gif, png, bitmap, etc. It can be used on the WorkSheet or UserForm. Please find more information about ActiveX Image Control by clicking on the following link. Label: Label is used to display descriptive text or information or instructions. It can be title, caption, etc. It can be used on the WorkSheet or UserForm. Please find more information about ActiveX Image Control by clicking on the following link. ListBox: ListBox ActiveX Control is used to display list of items to a list. ListBox can be used on the WorkSheet or UserForm. 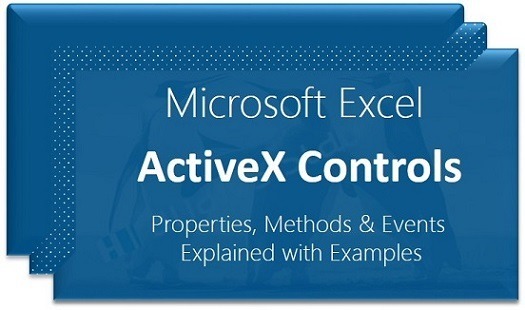 Please find more information about ActiveX ListBox Control by clicking on the following link. OptionButton: Option Button is used to select only one selection from multiple selections within a group. When we select an OptionButton on the user form in a group immediately it will de select all other OptionButtons in the same group. OptionButton has value property. Please find more information about ActiveX OptionButton Control by clicking on the following link. TextBox: TextBox is used to display data, edit data, etc in the rectangular box. The Textbox can be linked to a Worksheet Cell. The TextBox can have static and dynamic value. Please find more information about ActiveX TextBox Control by clicking on the following link. ActiveX controls. ActiveX controls can be utilized on worksheet frames, with or without the use of VBA code, and on VBA UserForms. As a rule, using ActiveX controls when you require more adaptable outline necessities than those given by Form controls.